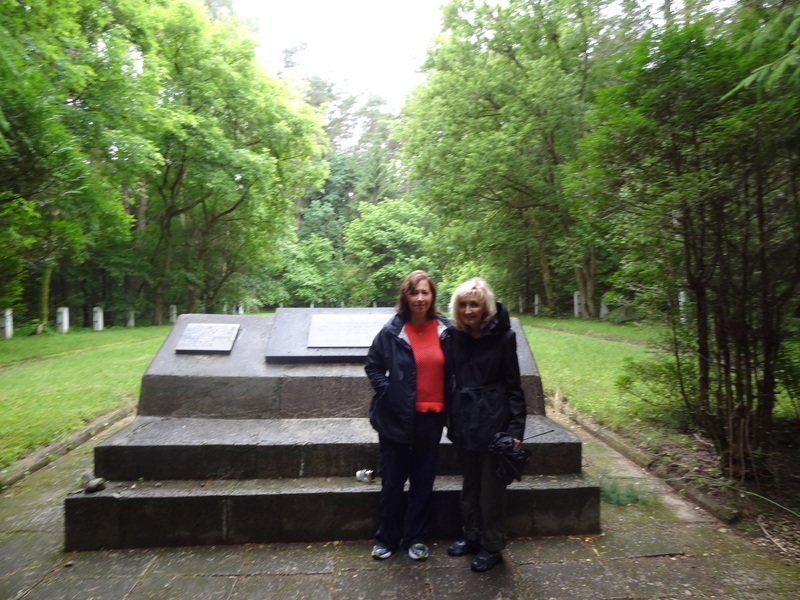 First, we went to the forests of Vilkija where the Jewish men of Seredzius were taken to be murdered. It was deep into the woods. There was a sign that led to a few forks in the road. We went down every fork on every angle until we finally found it. Our fabulous guide, Simon Davidovich, (simonasd@takas.lt) did his best to find it and he did! We were on an unpaved back road in the rain. 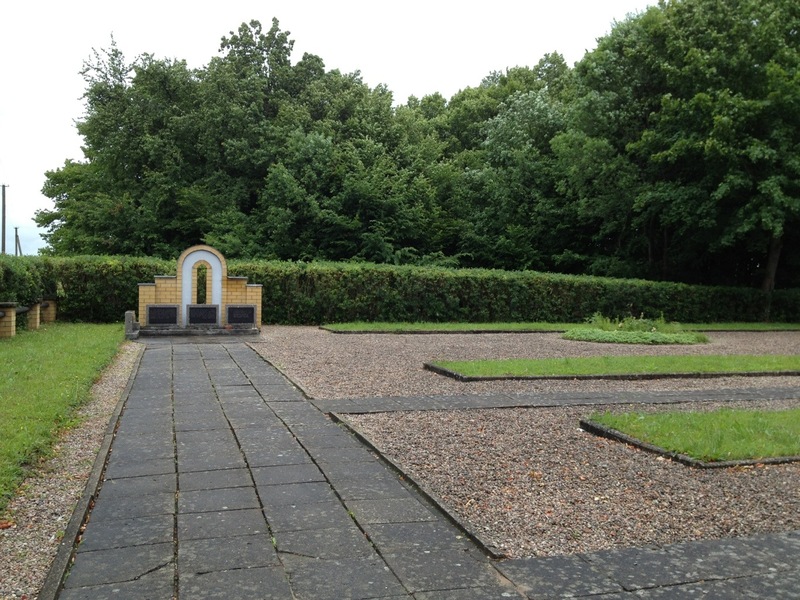 There was a well kept area with a memorial monument that read in Lithuanian and Hebrew, “on August 28, 1941 3500 peaceful citizens from the towns of Vilkija, Velliona, Seredzius , and Raudone were murdered here”. These were the Freymans. More info at http://holocaustatlas.lt It started to pore. 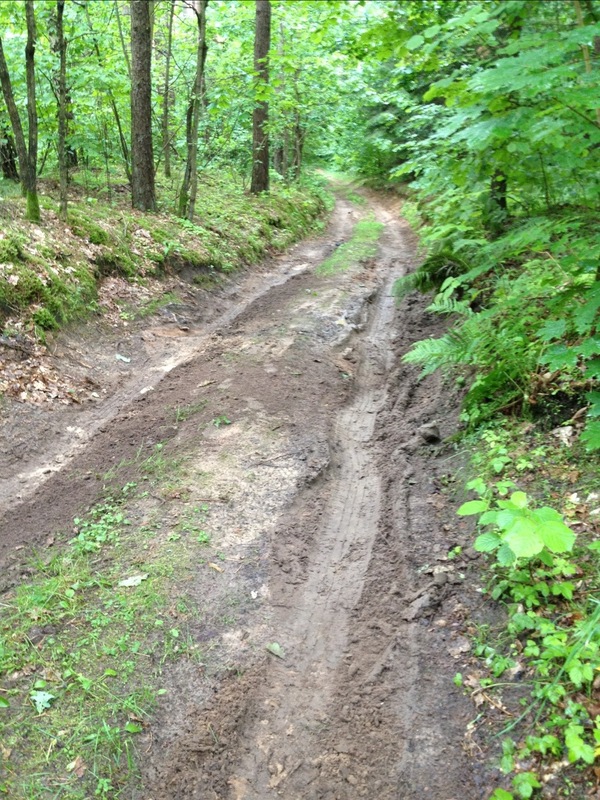 Coming up the hill, we got stuck in the mud with only inches on each side of the car. After numerous tries we made it out. Big sigh of relief. We then headed to Seredzius. The Jewish homes were very old and were in poor shape. Why do I call them Jewish homes? Jews had front doors, Lithuanians entered homes from the side. You can see in an attaches picture where a non-Jew changed a Jewish house. It was the same way in the city. We didn’t have any idea where our family lived on the one Jewish street. Simon told us sometimes if a family has daughters they would have 2 front doors. One for the daughters to have business and one for the family. See attached picture. Everything is very run down. Soviet times were very hard them it got harder because no one has money after their Independance in the 1990’s. It seems like in Soviet times there was only 3 colors of paint, yellow green and brown. The homes were in such disarray, there must not have been much paint in Soviet times. 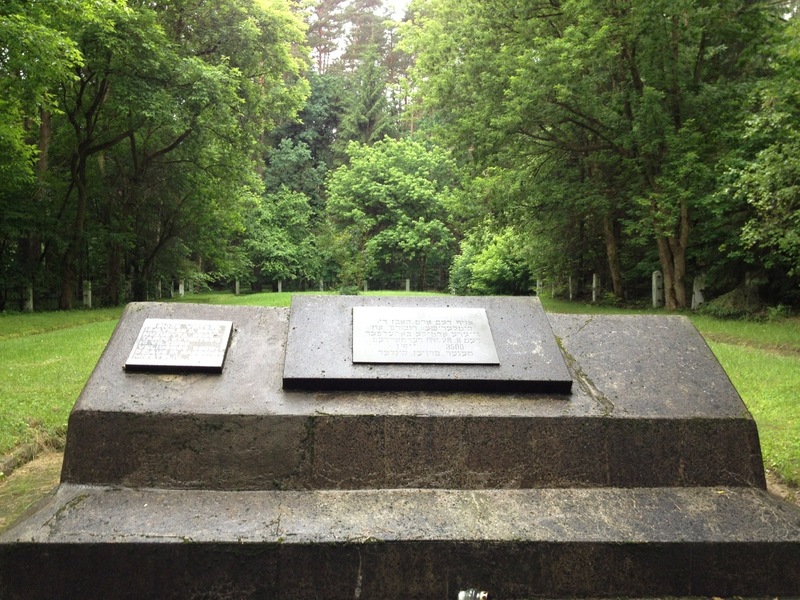 We went to the top of the hill where the Catholics live and there was the Jewish cemetery but only 2 stones. I had to climb to the top of a hill by myself to see it. It was soooo wet. We traveled next to Jurbarkas. My Zadie was matched up with his wife Bertha (who i am named after- no comment) down the river here in Jurbarkas. 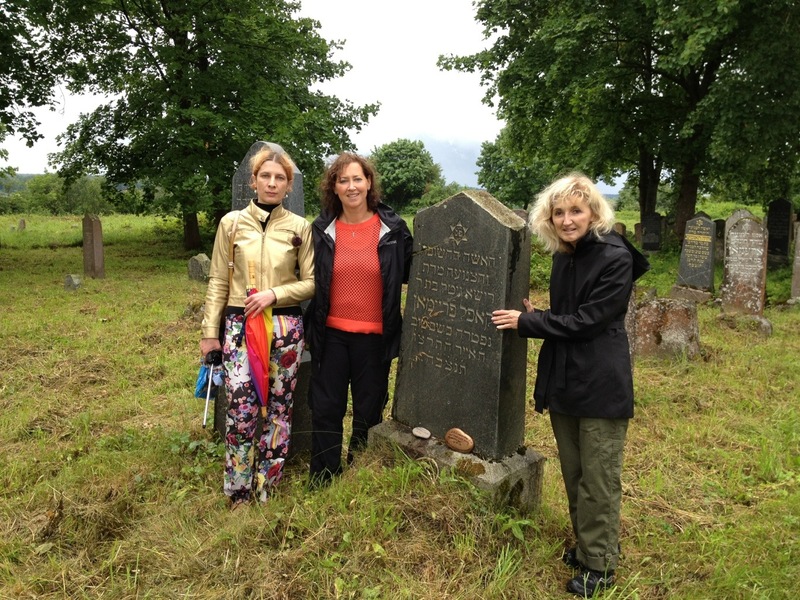 We drove into town and first stopped at the Jewish cemetery to meet Rita Vaivos. She is an angel from g-d. Out of her beautiful soul, she is independently handpainting and restoring the cemetery stones. I was introduced to her by my cousin Barbara Eisenberg from Florida. She met her on her roots tour a few years ago. We have been emailing each other over the past few months and is my local contact. She looks after the cemetery because there is no one else left to do it. She is not Jewish. We walked around the cemetery and she showed me all the beautiful work she has done. Simply incredible. I asked her if she found anything unusual. She said that a lot of the stones have Hebrew poetry. She said she has unearthed 3 new ones this year. She also mentioned that it must have been tradition to paint the letters on the stones because she finds several layers of color on many of them. Note to my family, I would like my stone with painted words. My great great grandmother Risa Gittle Freiman is buried here. My great grandfather (Sol Freeman) sent money to pay for a stone for his mother. 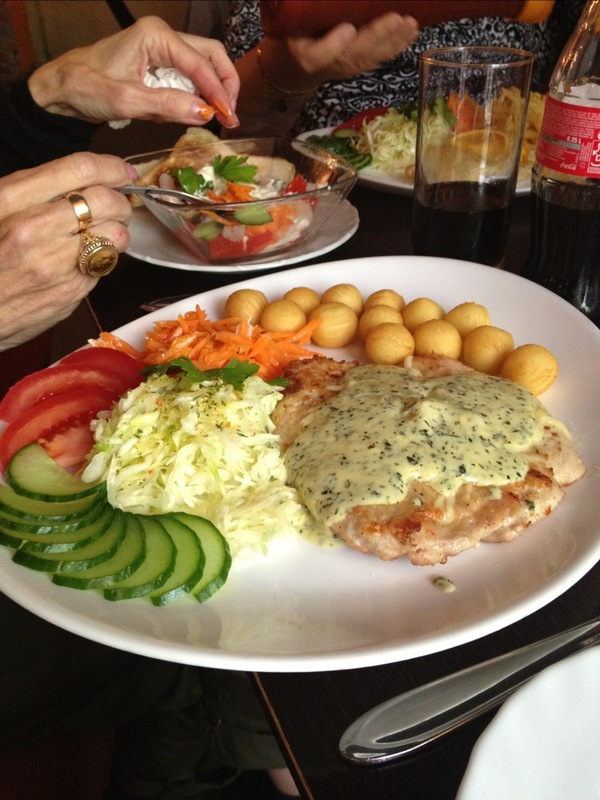 Her sister, daughter and son-in law ( we think) sent back a picture. See attached. They were murdered 4 years later in the mass grave next to the cemetery. ( see attaches photo). It is a Jewish custom to leave a stone at a cemetary, Bennett painted an Arizona river rock stone, we wrote on it and I left it at the grave. Maybe we will be back someday or future generations will see her legacy lives on. 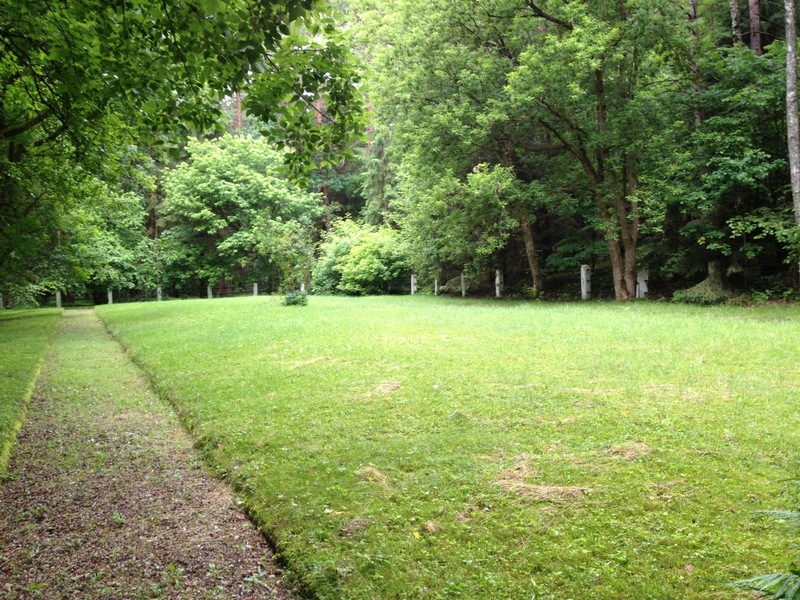 Next to the cemetery was the first mass murder grave site. 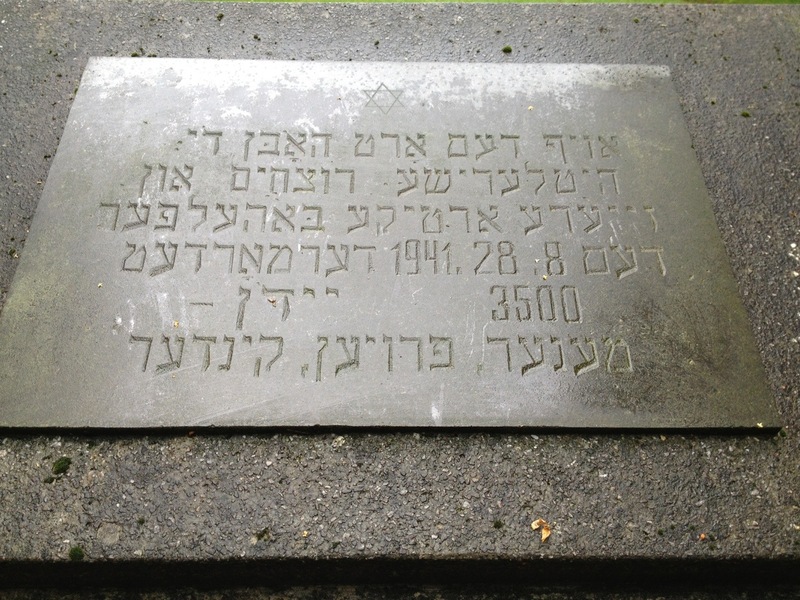 The inscription says”in 1941, the whole Jewish community of Jurbarkas of more than 2000 people, was destroyed. At this place on July 3, 1941, Hitler’s henchmen and their local helpers murdered more than 300 Jews and a fe dozen Lithuanians and Russians”. Also murdered there was Vincas Grybas. ( we will get to him after) It is so big. 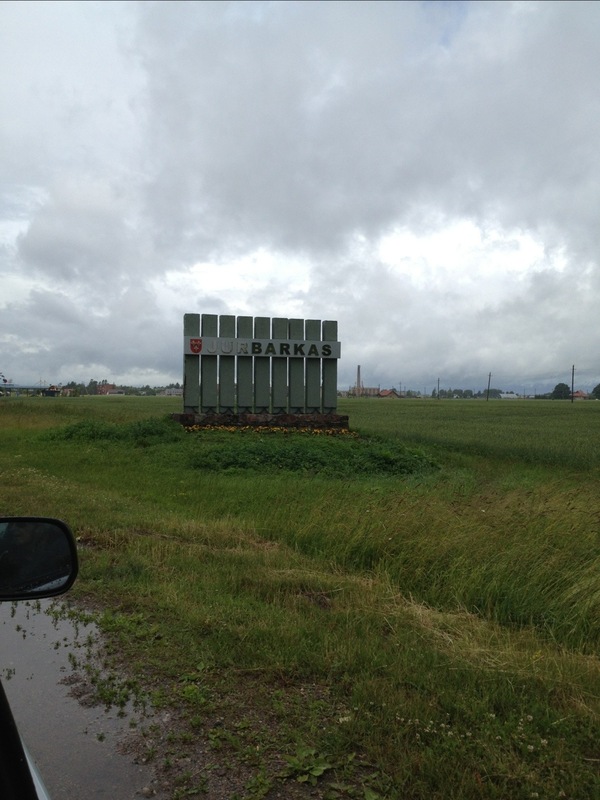 There are about 200 of these killing fields in Lithuania. So sad. Tears. 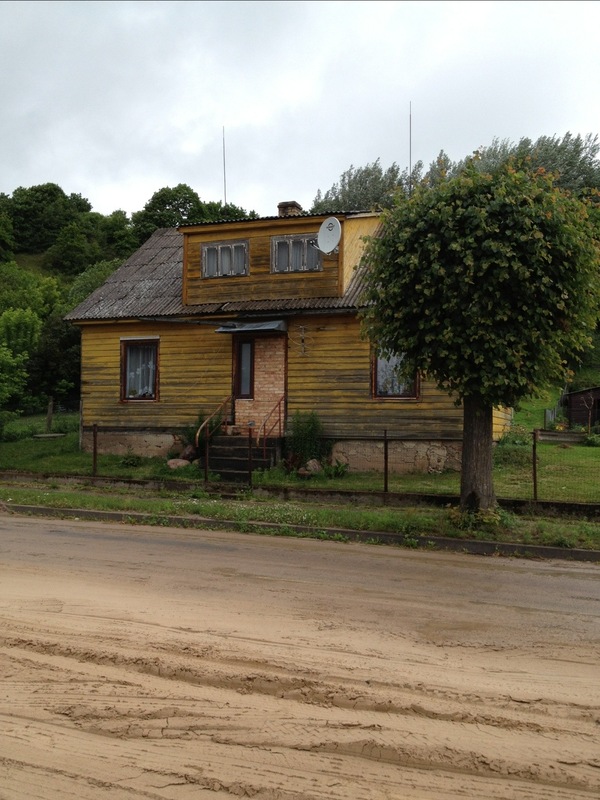 We then went to find my great great grandfather’s home on Kovno st. We think we found one of the two. One was just a foundation. 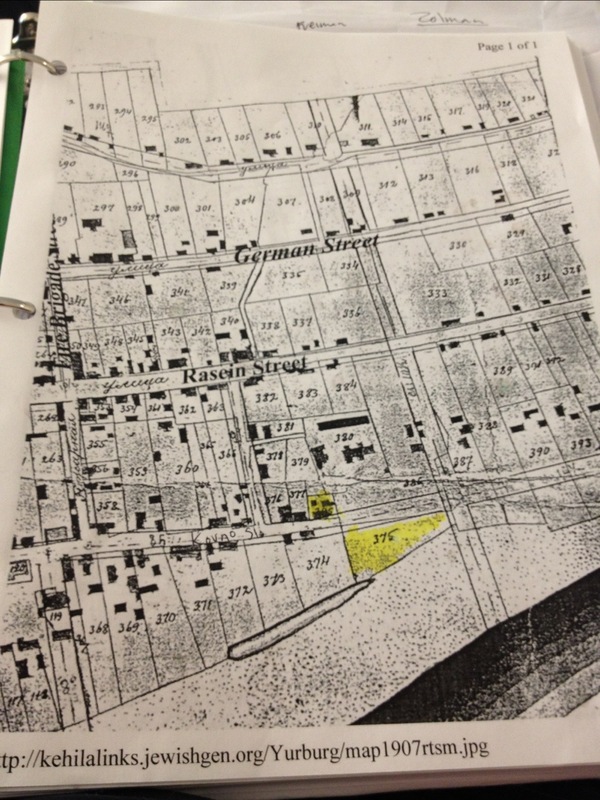 We had a map from 1907 and a plot plan from where he was lived. We matched up the current streets and we think we found their home and a foundation. (attached pic). Then it started to pour! We walked the street so we could take pictures. We got soaked. Had lunch (the picture of the building was a former Jewish bank) then went to see where the “gymnasium” was located. This is what they call “school.” It was still there but “tel-aviv” park was closed up because they are constructing a new library next to it. 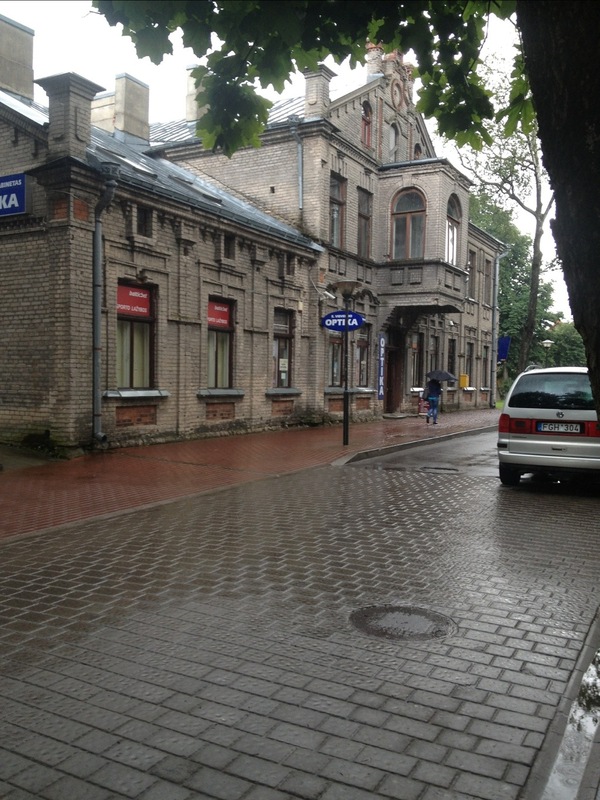 We then went to the Jurbarkas historical museum which was very disappointing. The woman who worked there was too busy to help us ( we were the only ones there) we watched a short film in Lithuanian. They supposively has a film about Jurbarkas Jews during the war but it couldn’t be found. There was nothing there about the Jews who were murdered from the town on display. Jews made up a huge percentage of the population before the war, shocking. The office of tourism was closed without notice. We bought a few souvenir items at the bookstore. We then went to the former home and studio of Vladis Grybas. 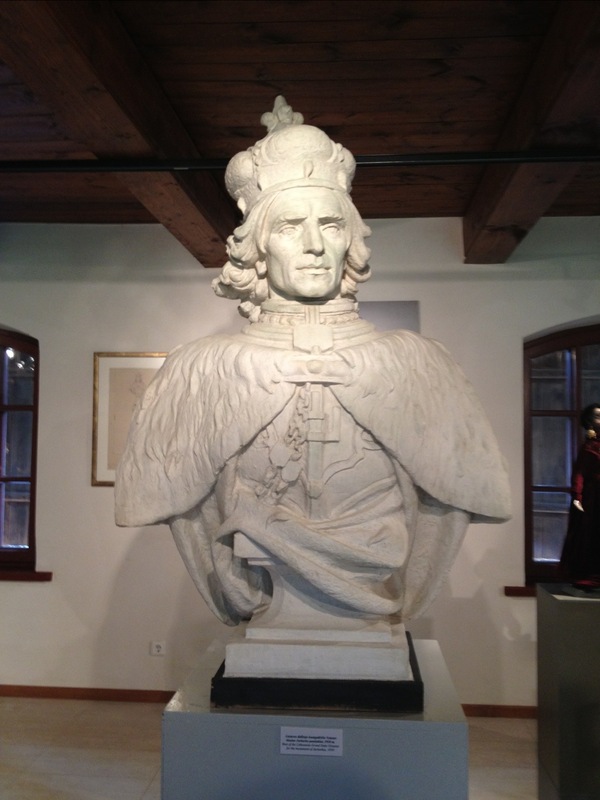 He was a very prominent christian sculpture until 1941 when he was accused of being a communist. 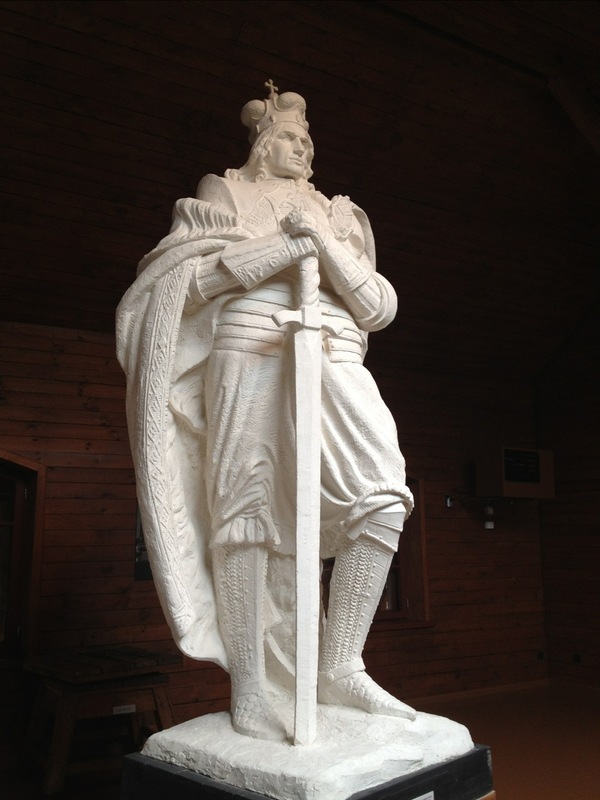 He was shot in the mass grave where our family is buried. We met his granddaughter at the studio. Beautiful woman. She took us around the home and studio. They teach sculpture there now. She left such an impression on me. Met back at the hotel and heard everyone’s stories and experiences with their root tours. 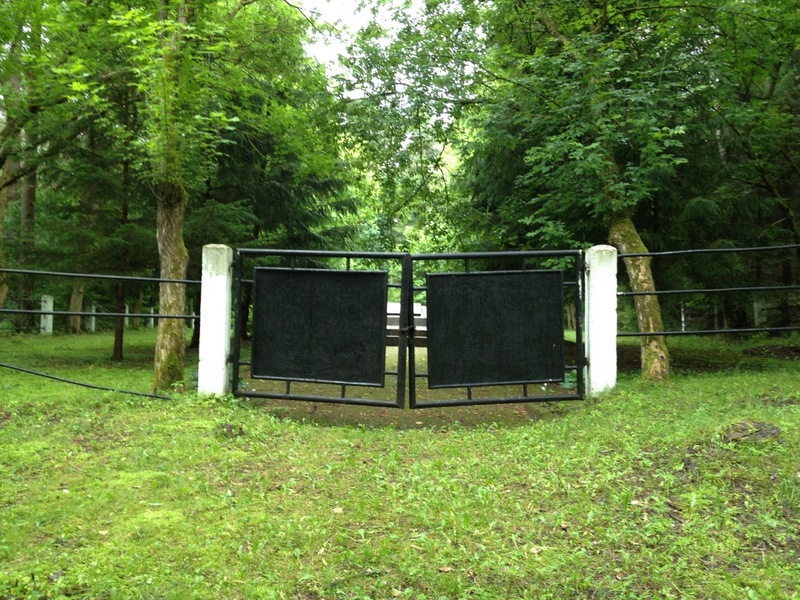 Two people didn’t make it across the border to Belarus. Another person had to buy health insurance at the border after a 2 hour wait. I am sure we will here more tomorrow. That is it for a long wonderful day. 3,500 were murdered here. Site of where the men of the town my great grandfather Sol Freeman was from were murdered. Simon got us out! We got stuck in the mud, very memorable moment, mom was a total panic! Entering Jurbarkas where my grandma Pauline Feldman was born. This was the moment we had been waiting for… to see the grave of my great great grandmother. We had a picture from 1935 of the family left behind. 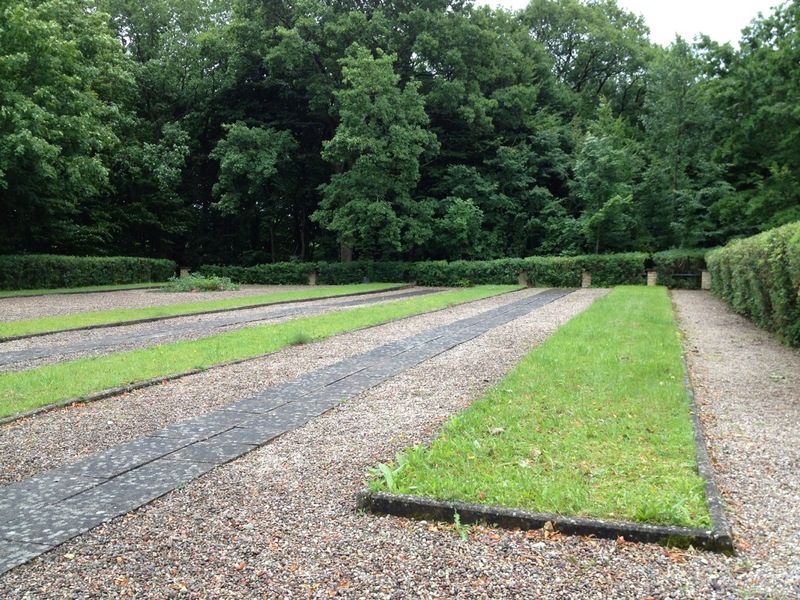 Adjacent to the cemetary was where they were murdered. Riva, is restoring and repainting the stones. They are so beautiful. 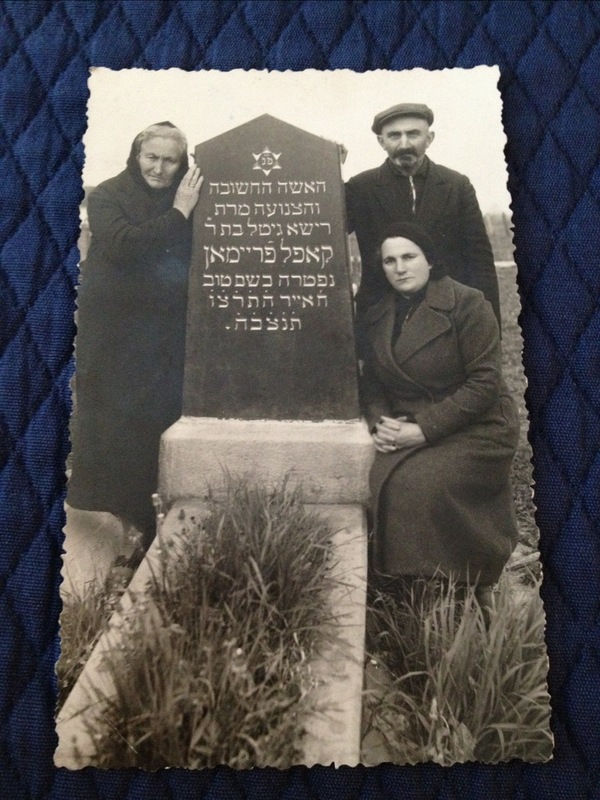 The 1936 photo of my gg grandmother’s grave. Those left behind were killed. 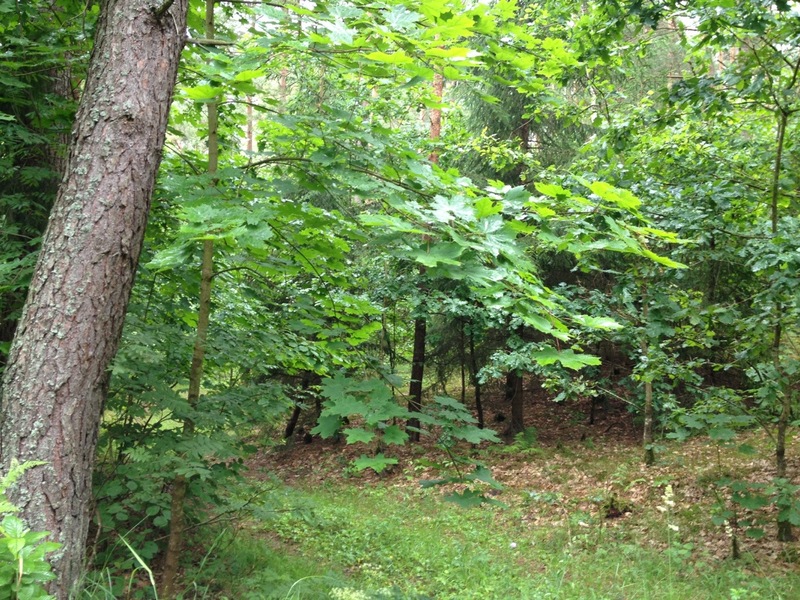 Leizer Liubovsky’s home and land!!! We found it, it matches up on the 1907 map. This is the home of my maternal great great grandfather. U will have lots to tell us once u are home. Thanks for keeping us posted daily. I opened my iPad daily just like we did with our UK relative. J.gun-why & looked forward to your blog. Beth, this is so great. I didn’t know how moving I would find it until I read your post. Did you know that you would find the famous Risa Gittel gravestone, or was this a surprise to you? (If we already knew that it still existed, I lost track of that somewhere along the way.) I can’t tell you how much I look forward to your daily posts. Tom, I knew that is was there from Rita. When we first connected I sent her a pic of the stone and she replied with a current photo. She thinks the original had silver paint. The cemetery was quite large and in tact. It is about the size of 1 1/2 football fields. The vegetation was about a foot deep. Lots of ants. There may have been more stones that sunk into the earth. She said there were local stones (large boulders) and imported stones like ours, likely from Italy. The few areas of mass murder that we saw were maintained. We were told that they cleaning up for Holocaust day in August. Amazing. 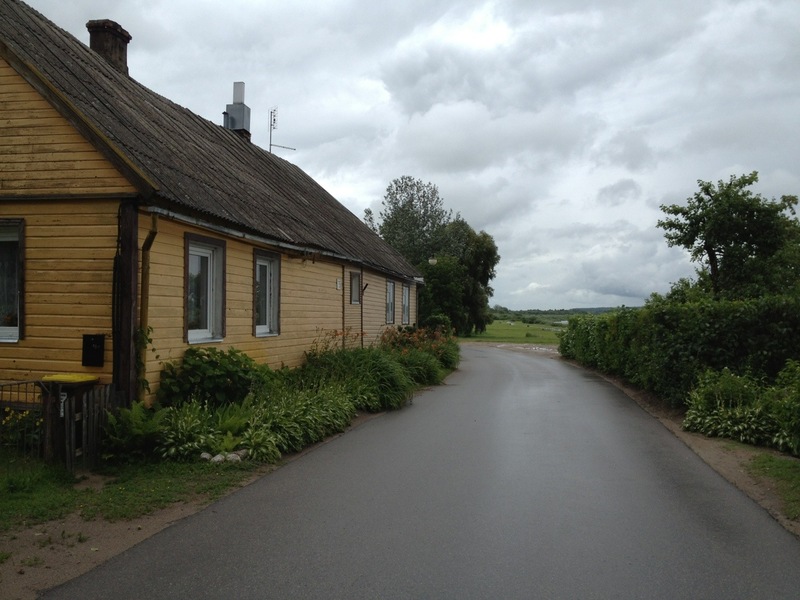 The house with the walled in front door is exactly as my mother described their home in seredzius – unpainted with a store to the left as soon as one entered. Thanks for sharing that. 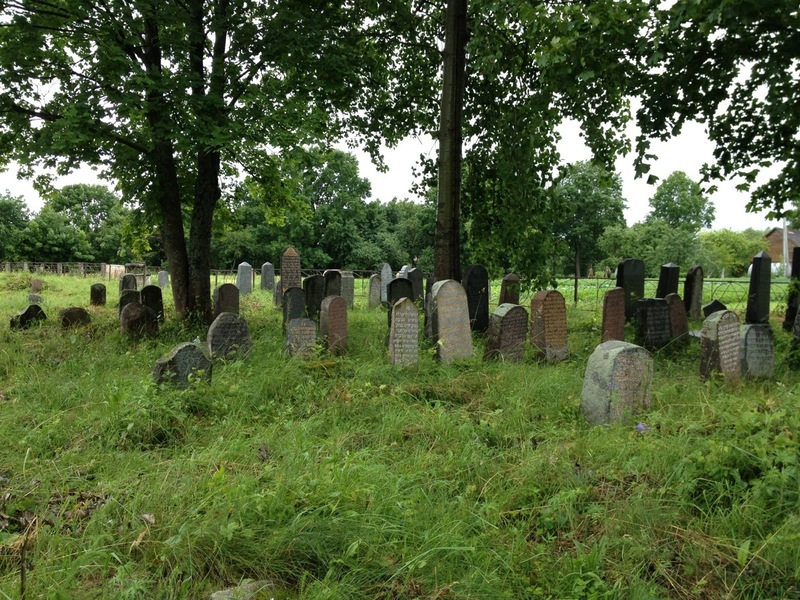 Chaim, I have more pictures of Seredzius and of the area of the mass killings. I only posted from my iphone pics for the blog. Once I upload the trip, I can invite you to the share site if you like or just email you the pics from the town. There is a cemetary there on a hill with 1 gravestone left. The jewish area was at the bottom of the hill, maybe 30 homes and the top of the hill is where the incredible church is located. It felt weird but I guess that is what it was like back then. Did you have any Freiman/Freyman/Freeman’s in your family? It was such a small town. I’d really appreciate seeing the pictures when you get them up. Freiman or Freeman isn’t a name I’ve come across. Coincidentally, the Rabbi of Seredzius, in the.1920’s was named Katz and his daughter was my mother’s friend.